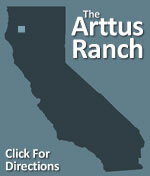 The Arttus Ranch is a vacation rental in the Trinity Alps just 10 miles east of Weaverville, California, about 45 minutes west of Redding. The ranch is used by families who want some summer or winter relaxation, groups who want a reunion, fishermen for the Trinity River across the road, and those who just want their vacation to provide them quiet and solitude. The Arttus Ranch sleeps up to 7 people and sits on 20 acres along the Trinity River. Just walk across the meadow to access the river for fishing, swimming, bird watching, gold panning or just relaxing. Or bring your canoe or kayak for a fun filled afternoon. Wintertime is gorgeous here with crisp, blue skies, intermittent snow fall and a cozy atmosphere that will have you wishing you were snowed in. Summertime is warm, without the intense heat from the Sacramento Valley. Summer evenings cool down and are ideal for outdoor barbeques. You can take a leisurely walk along the river or just sit in the cool shade and watch the osprey and bald eagles fly overhead. Pets are welcome at The Arttus Ranch. There's plenty of room for a dog to run. There are goats nearby for the kids to pet and a never-ending supply of wildlife for viewing. You can rent The Arttus Ranch by the day (2-day minimum), weekend or the week for trout, salmon or steelhead fishing, hiking, gold panning, adventure trips and more. Check our calendar of availability to book your next vacation.